Excerpted from "The Universe: Leading Scientists Explore the Origin, Mysteries, and Future of the Cosmos." It originally appeared as a speech given by Steinhardt at an event in 2002. If you were to ask most cosmologists to give a summary of where we stand right now in the field, they would tell you that we live in a very special period in human history where, thanks to a whole host of advances in technology, we can suddenly view the very distant and very early universe in ways we haven’t been able to do ever before. For example, we can get a snapshot of what the universe looked like in its infancy, when the first atoms were forming. We can get a snapshot of what the universe looked like in its adolescence, when the first stars and galaxies were forming. And we are now getting a full detail, three-dimensional image of what the local universe looks like today. When you put together this different information, which we’re getting for the first time in human history, you obtain a very tight series of constraints on any model of cosmic evolution. If you go back to the different theories of cosmic evolution in the early 1990s, the data we’ve gathered in the last decade has eliminated all of them save one, a model that you might think of today as the consensus model. This model involves a combination of the Big Bang model as developed in the 1920s, ’30s, and ’40s; the inflationary theory, which Alan Guth proposed in the 1980s; and a recent amendment that I will discuss shortly. This consensus theory matches the observations we have of the universe today in exquisite detail. For this reason, many cosmologists conclude that we have finally determined the basic cosmic history of the universe. But I have a rather different point of view, a view that has been stimulated by two events. The first is the recent amendment to which I referred earlier. I want to argue that the recent amendment is not simply an amendment but a real shock to our whole notion of time and cosmic history. And secondly, in the last year I’ve been involved in the development of an alternative theory that turns the cosmic history topsy-turvy: All the events that created the important features of our universe occur in a different order, by different physics, at different times, over different time scales. And yet this model seems capable of reproducing all the successful predictions of the consensus picture with the same exquisite detail. The key difference between this picture and the consensus picture comes down to the nature of time. The standard model, or consensus model, assumes that time has a beginning that we normally refer to as the Big Bang. According to that model, for reasons we don’t quite understand, the universe sprang from nothingness into somethingness, full of matter and energy, and has been expanding and cooling for the past 15 billion years. In the alternative model, the universe is endless. Time is endless, in the sense that it goes on forever in the past and forever in the future, and in some sense space is endless. Indeed, our three spatial dimensions remain infinite throughout the evolution of the universe. More specifically, this model proposes a universe in which the evolution of the universe is cyclic. That is to say, the universe goes through periods of evolution from hot to cold, from dense to under-dense, from hot radiation to the structure we see today, and eventually to an empty universe. Then, a sequence of events occurs that cause the cycle to begin again. The empty universe is reinjected with energy, creating a new period of expansion and cooling. This process repeats periodically forever. What we’re witnessing now is simply the latest cycle. The notion of a cyclic universe is not new. People have considered this idea as far back as recorded history. The ancient Hindus, for example, had a very elaborate and detailed cosmology based on a cyclic universe. They predicted the duration of each cycle to be 8.64 billion years—a prediction with three-digit accuracy. This is very impressive, especially since they had no quantum mechanics and no string theory! It disagrees with the number I’m going suggest, which is trillions of years rather than billions. The cyclic notion has also been a recurrent theme in Western thought. 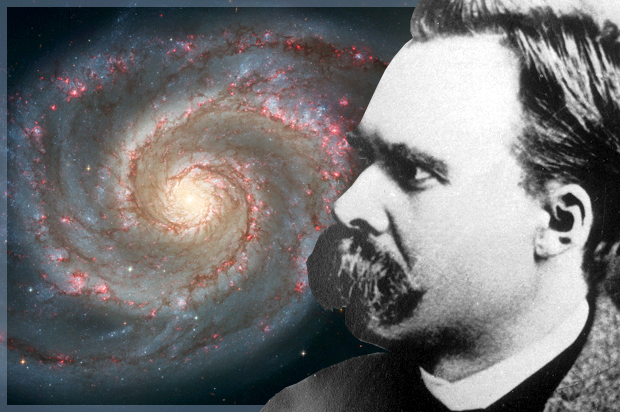 Edgar Allan Poe and Friedrich Nietzsche, for example, each had cyclic models of the universe, and in the early days of relativistic cosmology Albert Einstein, Alexander Friedmann, Georges Lemaître, and Richard Tolman were interested in the cyclic idea. I think it’s clear why so many have found the cyclic idea to be appealing: If you have a universe with a beginning, you have the challenge of explaining why it began and the conditions under which it began. If you have a universe that’s cyclic, it’s eternal, so you don’t have to explain the beginning. During the attempts to try to bring cyclic ideas into modern cosmology, it was discovered in the 1920s and ’30s that there are various technical problems. The idea at that time was a cycle in which our three-dimensional universe goes through periods of expansion beginning from the Big Bang and then reversal to contraction and a Big Crunch. The universe bounces, and expansion begins again. One problem is that every time the universe contracts to a crunch, the density and temperature of the universe rises to an infinite value, and it is not clear if the usual laws of physics can be applied. Second, every cycle of expansion and contraction creates entropy through natural thermodynamic processes, which adds to the entropy from earlier cycles. So at the beginning of a new cycle, there is higher entropy density than the cycle before. It turns out that the duration of a cycle is sensitive to the entropy density. If the entropy increases, the duration of the cycle increases as well. So, going forward in time, each cycle becomes longer than the one before. The problem is that, extrapolating back in time, the cycles become shorter until, after a finite time, they shrink to zero duration. The problem of avoiding a beginning has not been solved; it has simply been pushed back a finite number of cycles. If we’re going to reintroduce the idea of a truly cyclic universe, these two problems must be overcome. The cyclic model I will describe uses new ideas to do just that. To appreciate why an alternative model is worth pursuing, it’s important to get a more detailed impression of what the consensus picture is like. Certainly some aspects are appealing. But what I want to argue is that, overall, the consensus model is not so simple. In particular, recent observations have forced us to amend the consensus model and make it more complicated. So, let me begin with an overview of the consensus model. The consensus theory begins with the Big Bang: The universe has a beginning. It’s a standard assumption that people have made over the last fifty years, but it’s not something we can prove at present from any fundamental laws of physics. Furthermore, you have to assume that the universe began with an energy density less than the critical value. Otherwise, the universe would stop expanding and recollapse before the next stage of evolution, the inflationary epoch. In addition, to reach this inflationary stage, there must be some sort of energy to drive the inflation. Typically this is assumed to be due to an inflation field. You have to assume that in those patches of the universe that began at less than the critical density, a significant fraction of the energy is stored in inflation energy so that it can eventually overtake the universe and start the period of accelerated expansion. All of these are reasonable assumption, but assumptions nevertheless. It’s important to take into account these assumptions and ingredients, because they’re helpful in comparing the consensus model to the challenger. Assuming these conditions are met, the inflation energy overtakes the matter and radiation after a few instants. The inflationary epoch commences, and the expansion of the universe accelerates at a furious pace. The inflation does a number of miraculous things: It makes the universe homogeneous, it makes the universe flat, and it leaves behind certain inhomogeneities, which are supposed to be the seeds for the formation of galaxies. Now the universe is prepared to enter the next stage of evolution with the right conditions. According to the inflationary model, the inflation energy decays into a hot gas of matter and radiation. After a second or so, there form the first light nuclei. After a few tens of thousands of years, the slowly moving matter dominates the universe. It’s during these stages that the first atoms form, the universe becomes transparent, and the structure in the universe begins to form—the first stars and galaxies. Up to this point, the story is relatively simple. But there is the recent discovery that we’ve entered a new stage in the evolution of the universe. After the stars and galaxies have formed, something strange has happened to cause the expansion of the universe to speed up again. During the 15 billion years when matter and radiation dominated the universe and structure was forming, the expansion of the universe was slowing down, because the matter and radiation within it is gravitationally self-attractive and resists the expansion of the universe. Until very recently, it had been presumed that matter would continue to be the dominant form of energy in the universe and this deceleration would continue forever. But we’ve discovered instead, due to recent observations, that the expansion of the universe is speeding up. This means that most of the energy of the universe is neither matter nor radiation. Rather, another form of energy has overtaken the matter and radiation. For lack of a better term, this new energy form is called dark energy. Dark energy, unlike the matter and radiation we’re familiar with, is gravitationally self-repulsive. That’s why it causes the expansion to speed up rather than slow down. In Newton’s theory of gravity, all mass is gravitationally attractive, but Einstein’s theory allows the possibility of forms of energy that are gravitationally self-repulsive. I don’t think either the physics or cosmology communities, or even the general public, have fully absorbed the full implications of this discovery. This is a revolution in the grand historic sense—in the Copernican sense. In fact, if you think about Copernicus—from whom we derive the word “revolution”—his importance was that he changed our notion of space and of our position in the universe. By showing that the Earth revolves around the sun, he triggered a chain of ideas that led us to the notion that we live in no particular place in the universe; there’s nothing special about where we are. Now we’ve discovered something very strange about the nature of time: that we may live in no special place, but we do live at a special time, a time of recent transition from deceleration to acceleration; from one in which matter and radiation dominate the universe to one in which they are rapidly becoming insignificant components; from one in which structure is forming in ever larger scales to one in which now, because of this accelerated expansion, structure formation stops. We are in the midst of the transition between these two stages of evolution. And just as Copernicus’ proposal that the Earth is no longer the center of the universe led to a chain of ideas that changed our whole outlook on the structure of the solar system and eventually to the structure of the universe, it shouldn’t be too surprising that perhaps this new discovery of cosmic acceleration could lead to a whole change in our view of cosmic history. That’s a big part of the motivation for thinking about our alternative proposal. With these thoughts about the consensus model in mind, let me turn to the cyclic proposal. Since it’s cyclic, I’m allowed to begin the discussion of the cycle at any point I choose. To make the discussion parallel, I’ll begin at a point analogous to the Big Bang; I’ll call it the Bang. This is a point in the cycle where the universe reaches its highest temperature and density. In this scenario, though, unlike the Big Bang model, the temperature and density don’t diverge. There is a maximal, finite temperature. It’s a very high temperature, around 1020 degrees Kelvin—hot enough to evaporate atoms and nuclei into their fundamental constituents—but it’s not infinite. In fact, it’s well below the so-called Planck energy scale, where quantum gravity effects dominate. The theory begins with a bang and then proceeds directly to a phase dominated by radiation. In this scenario you do not have the inflation one has in the standard scenario. You still have to explain why the universe is flat, you still have to explain why the universe is homogeneous, and you still have to explain where the fluctuations came from that led to the formation of galaxies, but that’s not going to be explained by an early stage of inflation. It’s going to be explained by yet a different stage in the cyclic universe, which I’ll get to. In this new model, you go directly to a radiation-dominated universe and form the usual nuclear abundances; then go directly to a matter-dominated universe in which the atoms and galaxies and larger-scale structure form; and then proceed to a phase of the universe dominated by dark energy. In the standard case, the dark energy comes as a surprise, since it’s something you have to add into the theory to make it consistent with what we observe. In the cyclic model, the dark energy moves to center stage as the key ingredient that is going to drive the universe, and in fact drives the universe, into the cyclic evolution. The first thing the dark energy does when it dominates the universe is what we observe today: It causes the expansion of the universe to begin to accelerate. Why is that important? Although this acceleration rate is 100 orders of magnitude smaller than the acceleration that one gets in inflation, if you give the universe enough time it actually accomplishes the same feat that inflation does. Over time, it thins out the distribution of matter and radiation in the universe, making the universe more and more homogeneous and isotropic—in fact, making it perfectly so—driving it into what is essentially a vacuum state. Seth Lloyd said there were 1080 or 1090 bits inside the horizon, but if you were to look around the universe in a trillion years, you would find on average no bits inside your horizon, or less than one bit inside your horizon. In fact, when you count these bits, it’s important to realize that now that the universe is accelerating, our computer is actually losing bits from inside our horizon. This is something that we observe. At the same time that the universe is made homogeneous and isotropic, it is also being made flat. If the universe had any warp or curvature to it, or if you think about the universe stretching over this long period of time, although it’s a slow process it makes the space extremely flat. If it continued forever, of course, that would be the end of the story. But in this scenario, just like inflation, the dark energy survives only for a finite period and triggers a series of events that eventually lead to a transformation of energy from gravity into new energy and radiation that will then start a new period of expansion of the universe. From a local observer’s point of view, it looks like the universe goes through exact cycles; that is to say, it looks like the universe empties out each round and a new matter and radiation is created, leading to a new period of expansion. In this sense it’s a cyclic universe. If you were a global observer and could see the entire universe, you’d discover that our three dimensions are forever infinite in this story. What’s happened is that at each stage when we create matter and radiation, it gets thinned out. It’s out there somewhere, but it’s getting thinned out. Locally, it looks like the universe is cyclic, but globally the universe has a steady evolution, a well-defined era in which, over time and throughout our three dimensions, entropy increases from cycle to cycle. Exactly how this works in detail can be described in various ways. I will choose to present a very nice geometrical picture that’s motivated by superstring theory. We use only a few basic elements from superstring theory, so you don’t really have to know anything about superstring theory to understand what I’m going to talk about, except to understand that some of the strange things I’m going to introduce I am not introducing for the first time. They’re already sitting there in superstring theory waiting to be put to good purpose. One of the ideas in superstring theory is that there are extra dimensions; it’s an essential element to that theory, which is necessary to make it mathematically consistent. In one particular formulation of that theory, the universe has a total of eleven dimensions. Six of them are curled up into a little ball so tiny that, for my purposes, I’m just going to pretend they’re not there. However, there are three spatial dimensions, one time dimension, and one additional dimension that I do want to consider. In this picture, our three dimensions with which we’re familiar and through which we move lie along a hypersurface, or membrane. This membrane is a boundary of the extra dimension. There is another boundary, or membrane, on the other side. In between, there’s an extra dimension that, if you like, only exists over a certain interval. It’s like we are one end of a sandwich, in between which there is a so-called bulk volume of space. These surfaces are referred to as orbifolds or branes—the latter referring to the word “membrane.” The branes have physical properties. They have energy and momentum, and when you excite them you can produce things like quarks and electrons. We are composed of the quarks and electrons on one of these branes. And, since quarks and leptons can only move along branes, we are restricted to moving along and seeing only the three dimensions of our brane. We cannot see directly the bulk or any matter on the other brane. In the cyclic universe, at regular intervals of trillions of years, these two branes smash together. This creates all kinds of excitations—particles and radiation. The collision thereby heats up the branes, and then they bounce apart again. The branes are attracted to each other through a force that acts just like a spring, causing the branes to come together at regular intervals. To describe it more completely, what’s happening is that the universe goes through two kinds of stages of motion. When the universe has matter and radiation in it, or when the branes are far enough apart, the main motion is the branes stretching, or, equivalently, our three dimensions expanding. During this period, the branes more or less remain a fixed distance apart. That’s what’s been happening, for example, in the last 15 billion years. During these stages, our three dimensions are stretching just as they normally would. At a microscopic distance away, there is another brane sitting and expanding, but since we can’t touch, feel, or see across the bulk, we can’t sense it directly. If there is a clump of matter over there, we can feel the gravitational effect, but we can’t see any light or anything else it emits, because anything it emits is going to move along that brane. We only see things that move along our own brane. Next, the energy associated with the force between these branes takes over the universe. From our vantage point on one of the branes, this acts just like the dark energy we observe today. It causes the branes to accelerate in their stretching, to the point where all the matter and radiation produced since the last collision is spread out and the branes become essentially smooth, flat, empty surfaces. If you like, you can think of them as being wrinkled and full of matter up to this point, and then stretching by a fantastic amount over the next trillion years. The stretching causes the mass and energy on the brane to thin out and the wrinkles to be smoothed out. After trillions of years, the branes are, for all intents and purposes, smooth, flat, parallel, and empty. Then the force between these two branes slowly brings the branes together. As it brings them together, the force grows stronger and the branes speed toward one another. When they collide, there’s a walloping impact—enough to create a high density of matter and radiation with a very high, albeit finite, temperature. The two branes go flying apart, more or less back to where they are, and then the new matter and radiation, through the action of gravity, causes the branes to begin a new period of stretching. In this picture, it’s clear that the universe is going through periods of expansion and a funny kind of contraction. Where the two branes come together, it’s not a contraction of our dimensions but a contraction of the extra dimension. Before the contraction, all matter and radiation has been spread out, but, unlike the old cyclic models of the 1920s and ’30s, it doesn’t come back together again during the contraction, because our three dimensions—that is, the branes—remain stretched out. Only the extra dimension contracts. This process repeats itself cycle after cycle. If you compare the cyclic model to the consensus picture, two of the functions of inflation—namely, flattening and homogenizing the universe—are accomplished by the period of accelerated expansion that we’ve now just begun. Of course, I really mean the analogous expansion that occurred one cycle ago, before the most recent Bang. The third function of inflation—producing fluctuations in the density—occurs as these two branes come together. As they approach, quantum fluctuations cause the branes to begin to wrinkle. And because they’re wrinkled, they don’t collide everywhere at the same time. Rather, some regions collide a bit earlier than others. This means that some regions reheat to a finite temperature and begin to cool a little bit before other regions. When the branes come apart again, the temperature of the universe is not perfectly homogeneous but has spatial variations left over from the quantum wrinkles. Remarkably, although the physical processes are completely different and the time scale is completely different—this is taking billions of years, instead of 10-30 seconds—it turns out that the spectrum of fluctuations you get in the distribution of energy and temperature is essentially the same as what you get in inflation. Hence, the cyclic model is also in exquisite agreement with all of the measurements of the temperature and mass distribution of the universe that we have today. Because the physics in these two models is quite different, there is an important distinction in what we would observe if one or the other were actually true—although this effect has not been detected yet. In inflation when you create fluctuations, you don’t just create fluctuations in energy and temperature but you also create fluctuations in spacetime itself, so-called gravitational waves. That’s a feature we hope to look for in experiments in the coming decades as a verification of the consensus model. In our model, you don’t get those gravitational waves. The essential difference is that inflationary fluctuations are created in a hyperrapid, violent process that is strong enough to create gravitational waves, whereas cyclic fluctuations are created in an ultraslow, gentle process that is too weak to produce gravitational waves. That’s an example where the two models give an observational prediction that is dramatically different. It’s just difficult to observe at the present time. What’s fascinating at the moment is that we have two paradigms now available to us. On the one hand, they are poles apart in terms of what they tell us about the nature of time, about our cosmic history, about the order in which events occur, and about the time scale on which they occur. On the other hand, they are remarkably similar in terms of what they predict about the universe today. Ultimately what will decide between the two is a combination of observations—for example, the search for cosmic gravitational waves—and theory, because a key aspect to this scenario entails assumptions about what happens at the collision between branes that might be checked or refuted in superstring theory. In the meantime, for the next few years, we can all have great fun speculating about the implications of each of these ideas and how we can best distinguish between them.